October is Archives Month, and this year the Society of North Carolina Archivists has chosen the theme “North Carolina at Play: Health and Leisure in our State.” The State Archives has many diverse records in their collections that attest to the importance of health and leisure in the lives of North Carolinians. A select few from our collections are on display in the search room until the end of October. State Agency records include photographs and pamphlets from the State Board of Health about the role of exercise in the prevention of disease, materials from the Department of Public Instruction talking about the importance of physical education in school curriculum, and photographs from Samarcand Manor showing outdoor and physical recreation as a component of rehabilitation. Organization records include a tea towel from the North Carolina Chapter of the American Lung Association, an organization founded to fight tuberculosis. Military records include a school scrapbook from Scotland County depicting the motto “America needs healthy boys and girls for defense.” There are also many photographs from the Audio Visuals Materials Unit depicting the role of physical exercise and health in the schools and the community. All of these materials and more speak to the important role that health and leisure has played in the community, the government, and the culture of North Carolina and its people from as early as 1910 to the present. Come by and check them out today. This entry was posted in Events, News, Special Collections, State Agency Records and tagged Archives Month, audio visual materials, exhibits, medicine, North Carolina Archives Week, Search Room, sports, State Agency Records on October 15, 2014 by Ashley. RALEIGH — The annual Family History Fair celebrates links to our heritage. This year’s program offers presentations and a panel discussion about the types of evidence used to trace family ancestry-from public records to the mysterious world of DNA. The Fair will be held Saturday, Oct. 26 at the N. C. Department of Cultural Resources at 109 E. Jones Street, Raleigh. The Fair opens at 9 a.m. and the program begins at 10 a.m. Admission is free. Archivist Debbi Blake will present “Before the Vital Records Law: What’s a Family Historian to Do?” describing alternatives to the recording of births, deaths and marriages. North Carolina’s vital records law wasn’t enacted until 1913 and there was no systematic, statewide method for creating and preserving these data. In her presentation, Blake talks about alternative ways to find the data similar to that now recorded in vital records. Professional genealogist, Diane L. Richard, principal of MosaicRPM explores the enigmatic world of genes and the double helix in her presentation, “Who’s Your (Great-Grand) Daddy? : The basics of DNA testing for Genealogy.” Richards has recently attended several training sessions on the use of DNA testing for genealogical purposes and has worked with clients and their DNA test results for the last six years. Taking a swab of cells from inside of your check may reveal a heritage unknown to you, or confirm a link to your past but the process and the issues raised are a bit more complicated. Richards’ presentation will give a brief summary of the three types of genealogical DNA testing currently available, who can take them, what they can be used for (and also what they will not tell you), the current major providers and what’s trending now. The second part of her presentation will feature a panel of individuals who will relate their own stories about genetic testing. Members of the North Carolina Chapter of the Association of Professional Genealogists will be available for 15-minute “Ask the Genealogist” time slots for free consultations between 9:15 and 11:15 a.m. This service is on a first-come first-served basis. Vendors at the Fair include the Piedmont/Triad Chapter of the Afro-American Historical and Genealogical Society, the Charlotte Hawkins Brown Museum State Historic Site, the North Carolina Genealogical Society, the Wake County Genealogical Society, the Olivia Raney Local History Library, the Historic Jamestown Society, the Raleigh Family History Center and several booksellers, independent historians, researchers and archivists. There will be door prizes including a free online course from the National Institute of Genealogical Studies. The Fair is sponsored by the State Archives of North Carolina, the Government and Heritage Library of the State Library of North Carolina and the Friends of the Archives. The Family History Fair provides information and guidance for experienced family history researchers and beginners alike. For more information please visit http://www.ncdcr.gov/FamilyHistory or call (919)807-7450. The State Library and State Archives are both units of the N.C. Department of Cultural Resources. For more information on North Carolina arts, history and culture, visit Cultural Resources online. This entry was posted in Events and tagged events, Genealogy, North Carolina Archives Week, State Archives of North Carolina, State Library of North Carolina on October 25, 2013 by Ashley. Hi. My name is Brittany Boynton. I attend North Carolina Central University where I am working on my master’s degree in library science. I am currently working as an intern for the State Archives of North Carolina as part of my coursework. My internship consists of building the Food and Cooking Collection to support the 2013 North Carolina Archives Week theme of “Home Grown! A Celebration of N.C. Food Culture and History.” As part of my internship, I locate items on the topic of food and cooking in the collections at the State Archives. I also scan the items to create digital images and create the metadata for each of the items. Trademark Application: New Prague Flouring Mill Company, part of the Food and Cooking Collection in the North Carolina Digital Collections. Click on the image to see the original. The Food and Cooking Collection for the State Archives of North Carolina was just an idea a little over two months ago. The beginning of the collection started a lot like most hidden object games. I asked questions about the types of items that were to make up the collection. I started with the private collections at the suggestion of Francesca Perez and Ashley Yandle in order to find handwritten recipe books and vintage cookbooks. I went through a good portion of the collections that had been indexed as having recipes or cookbooks within the collection. The interesting thing about the private collections is that the collections also contain letters, poems, and journals. A lot of the letters and journals contained the details of the writers’ lives, and on occasion a recipe would be amongst the day-to-day musings and correspondence. A few collections even contained full recipe books, which were called “receipt books.” Two books were published books, which definitely showed their age, but did not have any of the fun marginalia that is usually found in old books. After finding a few items of interest, I began scanning the materials. Thanks to a very fast book scanner, I was able to scan full books in a matter of hours rather than days. After scanning the recipe books that I found, I created the metadata. Creating the metadata was interesting. After creating the metadata for the recipe books, it was time to go back to the Search Room to find more items to add to the collection. This time it was suggested that I look through trademark applications. Going through trademark applications that have been filed in North Carolina has been a lot of fun; so far, I have looked through all of the applications from 1910 to 1928. A lot of the applications were for non-food related items, which I expected. The majority of the applications for food-related products was from flour mills and carbonated beverage companies. I was surprised by the amount of companies that were developing carbonated beverages during this time. I scanned and created metadata for some interesting trademarks as well. I am continuing to learn about creating metadata, which is more fun than I thought it would be. This entry was posted in Digital Collections, Digital Projects, News and tagged cooking, foodways, North Carolina Archives Week, North Carolina Digital Collections, Private Collections, State Agency Records on October 25, 2013 by Ashley. Governor Pat McCrory has proclaimed October 21-27, 2013 Archives Week in North Carolina and the State Archives of North Carolina in Raleigh presents a number of related programs to appeal to a variety of audiences. Bring in your family films to share with others on “Home Movie Day,” Saturday, October 19. Home Movie Day is an international event held in local communities around the world. It provides an opportunity for attendees to bring in their home movies, learn more about their own family films, and—most importantly—watch and share them with others. Film archivists will be on site to share information about how to care for and preserve these family treasures. Depending on the condition, attendees will have the chance to view their own films on the big screen. Equipment provided by A/V Geeks Transfer Services will allow participants to get a free transfer of their film. Bring in films of any film format—8 mm, Super8, 16mm—as well as VHS or Video8 format (cued up, five-minute limit please). Home Movie Day will be held from 1:00 to 4:00 p.m. in the auditorium at 109 East Jones St. in Raleigh. Last spring law professor John V. Orth and Justice Paul Martin Newby released a new edition of The North Carolina Constitution with History and Commentary, a textbook which provides the historical context of this important document. In honor of the book, two related programs will be presented on October 21. At noon a program for attorneys, “Review of North Carolina Constitutional Law,” features a panel discussion and case updates from Professor Orth and Justice Newby in the area of state constitutional law. For those law professional wishing to earn one hour of CLE credit, register for this program at rsvpforconlawcle@gmail.com. In the evening the public is invited for “A Historical Primer on the North Carolina Constitution” with both scholars. That program begins at 6:00 p.m. with refreshments to follow. The state constitution will be on loan from the Secretary of State’s office that day and will be displayed in the lobby of the building from 11:00 a.m. to 7:00 p.m. A few books will be available for purchase and autographs. These programs are sponsored by the Friends of the Archives and the Government and Heritage Library of the State Library of North Carolina. Archives Week ends with the annual Family History Fair on Saturday, October 26 in partnership with the Friends and the Government and Heritage Library. This year the Fair focuses on examining the evidentiary materials used in tracing family ancestry. Presentations will cover traditional paper records and introduces the world of DNA testing in genealogical research. In addition to the presentations, the day will feature vendors, “Ask a Genealogist” sessions, door prizes, and more. All of these programs are free and are held at 109 East Jones Street, Raleigh. Please check www.ncculture.com for a complete and current listing. For more information about Archives Week activities around the state visit the website of the Society of North Carolina Archivists. To read the proclamation, visit: http://www.ncdcr.gov/portals/26/PDF/NewsAndEvents/archivesWeek_proclamation_2013.pdf. This entry was posted in Events, News and tagged events, governors, North Carolina Archives Week, State Archives of North Carolina on October 14, 2013 by Ashley. Home Movie Day is a Crash Course in American Culture. It’s a Social Event…Bring Films, Watch Films and Play Bingo! Home Movie Day 2013 Poster. Click on the image to see a larger version. 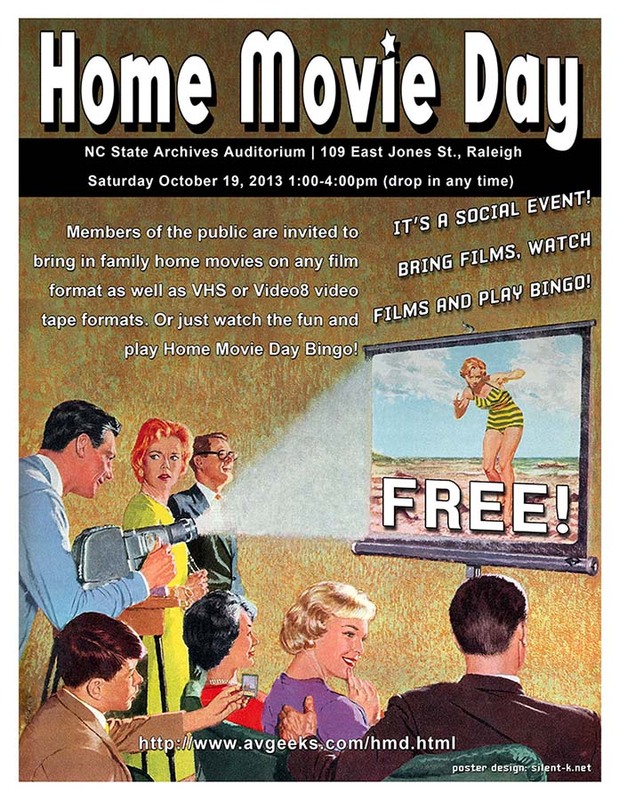 Raleigh, NC – Home Movie Day Raleigh will be held on Saturday, October 19, 2013 from 1:00-4:00pm in the auditorium at the State Archives of North Carolina, 109 East Jones Street, Raleigh. The event is free and free parking is available around the Archives. This year’s event is sponsored by the Film Studies Program at NCSU, the State Archives of North Carolina and A/V Geeks Transfer Services. Participants spend the afternoon watching amateur films and win prizes playing Home Movie Day bingo. Members of the public are invited to bring in cinematic artifacts of their personal pasts on any film format – 8mm, Super8, 16mm home movie – as well as VHS or Video8 format (cued up, 5 minute limit) for inspection, discussion, and on-site projection. Depending on the condition of the films, attendees will have the chance to view their own films on the big screen. Equipment provided by A/V Geeks Transfer Services will allow participants to get a free transfer of their film. Now in it’s 11th year, Home Movie Day is an international event held in local communities around the world. It provides an opportunity for attendees to bring in their home movies, learn more about their own family films, and—most importantly—watch them and share them with others! Film archivists are on site and to share information about how to care for films and videotapes so they can be enjoyed by future generations. Because they are local events, Home Movie Day screenings can focus on family and community histories in a meaningful way. For more information about Home Movie Days around the world go to http://homemovieday.com/. This entry was posted in Events, News and tagged events, movies, North Carolina Archives Week, Raleigh, Triangle Home Movie Day on October 2, 2013 by Ashley. The Friends of the Archives workshop on digital preservation scheduled for the auditorium of the State Archives building at 9:00 on October 25 is cancelled. We are sorry for any inconvenience this may cause. If you are currently scheduled, we will keep your name on file in case we decide to reschedule in the spring. This entry was posted in News and tagged North Carolina Archives Week, Preservation, workshops on October 24, 2012 by Ashley. On Saturday Archives Week kicked off with Triangle Home Movie Day. As always, the event was well attended and a very enthusiastic crowd enjoyed the home movies brought in by their fellow participants. You can sample some of the feel of Home Movie Day celebrations across the world, including our own, by looking at the Twitter hash tag #HMD2012. Yesterday I gave a talk as part of our celebration of North Carolina Archives Week. The talk, titled “Armchair Historians: Tools You Can Use At Home or On The Go,” covered some of our online resources including our online catalog MARS, the North Carolina Digital Collections, our social media, and some news about new projects and tools on the horizon. If you missed it but would like to read through the slides and presenters notes, a PDF version is available online. We also had an exhibit in the Search Room yesterday – “Civil War to Civil Rights in North Carolina,” a display of documents and photographs relating to the Archives Week theme, “Journeys to Justice: Civil Rights in North Carolina.” Look for a blog post recap of that event later this week. This entry was posted in News and tagged African American History, exhibits, Genealogy, lectures, MARS, North Carolina Archives Week, North Carolina Digital Collections, social media, Triangle Home Movie Day on October 23, 2012 by Ashley.